Okay, I’ll confess – I think I have a (slightly) obsessive personality. Fortunately, the stuff I tend to obsess over is generally pretty positive. I don’t obsess about my weight, our kids, money, cleanliness, nor, the biggie these days – aging (although I have to suppress regret about all the sun worshipping I did when I was young and stupid – as an example I used to go Spring skiing with baby oil slathered on my face! What a doofus!). When I dive, I don’t think I am overly obsessive about my gear, my pre-dive routine, nor my dive profiles. I love to dive – any place, any time – and I can even be entertained by diving in a backyard pond (and I’ve got the pics to prove it ;^). Some varieties, particularly Saddle Back Anemonefish, are pretty brazen little bastards, and will swim metres away from their host anemones to nip and ping divers (which hurts!). Others, like the adorable False Clown Anemonefish (Nemos), are more the stay-at-home type, but become quite animated when divers approach – flitting and swimming up and down in the water column a foot or so above their anemones, in a constant dance that makes them tough to photograph. Others still are quite reclusive, and will dive into the tentacles of anemones, and maybe peek their heads out every now and then to see if you are still camped over them. 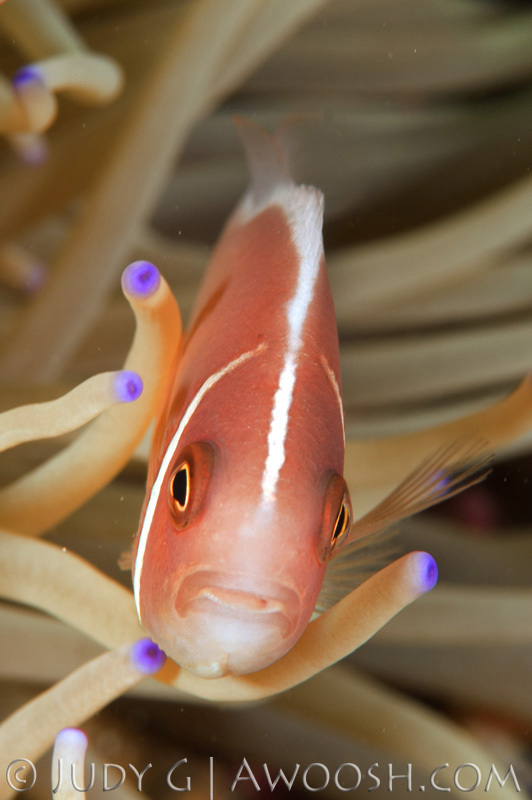 This entry was posted in All About Scuba Diving, Pic of the Day and tagged Pink Anemonefish. Bookmark the permalink.